Human Resource Information Systems (HRIS) have become one of the most important tools for many businesses. Even the small, 20-person office needs to realize the benefits of using HRIS to be more efficient. Many firms do not realize how much time and money they are wasting on manual human resource management (HRM) tasks until they sit down and inventory their time. HRIS is advancing to become its own information technology (IT) field. It allows companies to cut costs and offer more information to employees in a faster and more efficient way. Especially in difficult economic times, it is critical for companies to become more efficient in every sector of their business; human resources (HR) is no exception. HRIS refers to software packages that address HR needs with respect to planning, employee information access, and employer regulatory compliance. The following text begins with a discussion of human resource planning, followed by human resource management systems. American companies must now operate in a rapidly changing business environment. These changes have important implications for HRM practices. To ensure that management practices support business needs, organizations must continually monitor changing environmental conditions and devise HRM strategies for dealing with them. The procedure used to tie human resource issues to the organization's business needs is called human resource planning. Also known as HR planning, this procedure is defined as the "process of identifying and responding to [organizational needs] … and charting new policies, systems, and programs that will assure effective human resource management under changing conditions." The purposes of HR planning are to enable organizations to anticipate their future HRM needs and to identify practices that will help them to meet those needs. HR planning may be done on a short- or long-term (three or more years) basis. Its aim is to ensure that people will be available with the appropriate characteristics and skills when and where the organization needs them. The use of HR planning enables companies to gain control of their future by preparing for likely events. That is, they can anticipate change and devise appropriate courses of action. When companies learn how to capitalize on future events, their own future improves. As valuable as HR planning is, many companies ignore this opportunity. Some see it as too difficult and frustrating, while others simply do not see the need for it. However, when failing to properly plan for their human resources, employers are forced to respond to events after they occur, rather than before; they become reactive, rather than proactive. When this outcome occurs, an organization may be unable to correctly anticipate an increase in its future demand for personnel. At best, such a company would be forced to recruit personnel at the last minute and may fail to find the best candidates. At worst, the company may become seriously understaffed. Number of employees 240 200 165 215 ? consequences. For instance, the understaffing could cause existing employees to experience a great deal of stress as they attempt to meet additional demand without adequate resources and assistance. If required work is not getting done, the firm ultimately may experience an increase in back orders, which could cause a decrease in customer goodwill, an increase in competition, and a loss of market share. When engaged in human resource planning, a company derives its human resource needs by first forecasting its demand for human resources (i.e., the number and types of people needed to carry out the work of the organization at some future point in time), and then its supply (i.e., the positions that are expected to be already filled). The difference between the two forecasts signifies the firm's HR needs. For example, if a firm estimates that it will demand 12 accountants during the next fiscal year and expects to retain its supply of nine who are already on staff, its HR need would be to hire three additional accountants. Following is a closer look at how a company can determine its HR needs and devise plans to meet them. Demand forecasting involves predicting the number and types of people the organization will need at some future point in time. There are two general approaches to demand forecasting: statistical and judgmental. Using a statistical approach, an organization predicts its needed workforce size on the basis of certain business factors. A business factor is an attribute of the business, such as sales volume or market share, which closely relates to the size of the needed workforce. For example, a hospital could use the business factor of projected patient load to predict the number of nurses it would need at some point in time. A statistical approach to demand forecasting typically is used when an organization operates in a stable environment, where an appropriate business factor can be predicted with some degree of certainty. For example, a statistical approach may be appropriate for a hospital located in an area with little population growth. Organizations operating in less stable environments (e.g., a hospital in an area experiencing explosive growth and change) are more likely to rely on a judgmental approach. The most commonly used statistical methods of demand forecasting are trend, ratio, and regression analysis. In trend analysis, the future demand for human resources is projected on the basis of past business trends regarding a business factor. 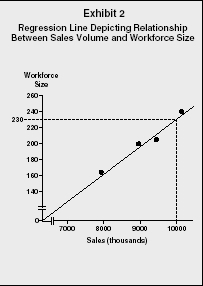 An example of a trend analysis is illustrated in Exhibit 1, which depicts the relationship between a business factor (namely, sales volume) and workforce size. As one can see from the exhibit, if the company expects its 2010 sales to be $10 million, it will need to increase its workforce to a size of nearly 240, which is the number of employees it had in 2006 when sales were $10.2 million. Ratio analysis is the process of determining future HR demand by computing an exact ratio between the specific business factor and the number of employees needed. It thus provides a more precise estimate than trend analysis. For instance, the demand for professors at a university could be forecast on the basis of the student-faculty ratio. Suppose that a university has 10,000 students and 500 professors; the student-faculty ratio is thus 10,000:500 or 20:1. This ratio means that for every 20 students, the university needs 1 professor. If the university anticipates a student enrollment increase of 1,000 for next year, it would need to hire 50 (1000/20) new professors. This is in addition to any hiring needed to fill vacancies from existing faculty who might leave in the meantime. Regression analysis is similar to both trend and ratio analyses in that forecasts are based on the relationship between a business factor and workforce size. However, this method is more statistically sophisticated. Using statistical software, the analyst first creates a scatter diagram depicting the relationship between the business factor and workforce size. The software can then calculate a regression line, which cuts right through the center of the points on the scatter diagram. (The regression line is mathematically determined using a formula found in most statistical texts.) By inspecting values along the regression line, one can see how many employees are needed at each value of the business factor. Both ratio analysis and regression analysis are aspects of human resource management systems (HRMS) packages, and therefore provide the business with the capabilities to calculate more accurate and timely forecasts. An example of how regression analysis can be used to project HR demand is shown in Exhibit 2. In this example, the figures used in the trend analysis (Exhibit 1) are now depicted in the form of a scatter diagram. The line running through the center of the points plotted on the scatter diagram is the regression line. To determine the number of employees needed when the sales volume is $10 million, one would follow the path indicated by the dashed line. One would start at the point on the X axis reading "10,000," and then move up vertically until reaching the regression line. The value on the Y axis corresponding to that point (i.e., 230) reflects the needed workforce size. Statistical methods of demand forecasting assume that the relationship between workforce size and the business factor remains constant over time. If this relationship were to change unexpectedly, the forecast would become inaccurate. For example, the forecast of needed professors based on the student-faculty ratio would be inaccurate if the university decided to change its teaching approach and institute distance learning classes. This approach to teaching involves the use of video equipment, which can beam the professor's lectures to many different locations, thus allowing many more students to enroll in the class. Consequently, the 20:1 ratio would no longer apply; the university would now be able to function with fewer professors (or at least more students per professor). Judgmental approaches to demand forecasting involve the use of human judgment, rather than a manipulation of numbers. Two of the most commonly used judgmental techniques are group brainstorming and sales force estimates. The group brainstorming technique of demand forecasting uses a panel of experts (i.e., people within the organization who collectively understand the market, the industry, and the technological developments bearing on HRM needs). These experts are asked to generate a forecast through the process of brainstorming. A variety of brainstorming techniques exist. Most involve a face-to-face discussion among group members, who are asked to reach a consensus. The accuracy of the forecasts depends on the correctness of these assumptions. Of course, the future is very difficult to predict because it is subject to many uncertainties. Therefore, the organization must continually monitor its demand forecasts in light of any unexpected changes. HRMS packages facilitate the calculation and monitoring of demand forecasts. The use of sales force estimates represents another judgmental approach for forecasting HR demand. This approach is most appropriately used when the need for additional employees arises from the introduction of new products. When a new product is launched, sales personnel are asked to estimate the demand for the product (i.e., expected sales volume) based on their knowledge of customer needs and interests. The organization then uses this information to estimate how many employees will be needed to meet this demand. One drawback of this approach is the possibility of bias. Some sales personnel may purposely underestimate product demands so they will look good when their own sales exceed the forecasts. Others may overestimate demand because they are overly optimistic about their sales potential. Once a demand forecast has been made, an organization has a relatively good idea of the number and nature of positions it will need to carry out its work at a particular point in time. It then estimates which of these positions will be filled at that time by individuals who already are employed by the company. The process used to make this estimation is called supply forecasting. Supply forecasting is a two-step process. HRMS packages provide the employer with the means to automate much of these two steps. In the first step, the organization groups its positions by title, function, and responsibility level. These groupings should reflect levels of positions across which employees may be expected to advance. For instance, the HRM group might include the job titles of HR assistant, HR manager, and HR director. The secretarial group might include secretarial clerk, principal secretary, senior secretary, and administrative assistant. The second step of supply forecasting is to estimate, within each job group, how many current employees will remain in their positions during the planning period, how many will move to another position (e.g., through transfer, promotion, or demotion), and how many will leave the organization. These predictions are partially based on past mobility trends (e.g., turnover and promotion rates). The organization also should consider any plans for mergers, acquisitions, unit or division divestitures, layoffs, retrenchments and downsizing, and even hostile takeovers. When making its supply forecast, the organization also should look at specific individuals. Some may have already announced, for instance, that they are retiring at the end of the year, returning to school in the fall, or getting married and planning on moving to a different part of the country. Computerized statistical packages are available to help estimate the flow of employees through an organization. The estimates generated by these packages can be fairly accurate in stable environments. When the environment is unstable, of course, these estimates are suspect. For instance, an organization may base its estimates on past turnover rates, which have been about 10 percent during each of the past five years. If the turnover rate were to change drastically because of factors such as job dissatisfaction or down-sizing, the organization would severely underestimate its future staffing needs. Combining the results of the supply and demand forecasts within each job group derives specific staffing needs. For example, consider a firm that currently employs twenty-five secretaries. As the result of its supply forecast, the firm predicts that five of these secretarial positions will become vacant by the end of the planning period because of retirements, promotions, and so forth. Its demand forecast predicts that three new secretarial positions will be needed during the coming period because of an increased demand for the company's product. By combining these two estimates, the firm now realizes that it must hire eight new secretaries (five to replace those expected to vacate their positions, plus three to fill the newly created positions). When the HR planning process is completed, a firm must establish and implement HRM practices in order to meet its human resource needs. Following is a brief overview of how HRM practices can help organizations to deal with anticipated oversupplies and undersupplies of personnel. The trend toward organizational restructuring usually results in a smaller workforce. Therefore, when an organization's strategic plan calls for restructuring, the HRM response usually is one of downsizing. Downsizing usually results in layoffs. Because of the negative outcomes that are often associated with layoffs, employers are encouraged to seek alternatives, such as hiring freezes, early retirements, restricted overtime, job sharing, and pay reductions. When the results of demand and supply forecasting project an undersupply of personnel at some future point in time, the organization must decide how to resolve this problem. The solution may involve hiring additional staff, but there are other options. When HR plans indicate an undersupply of employees, firms can recruit personnel to staff jobs with anticipated vacancies. HRMS packages provide employers with capabilities to carry out recruitment in all of its steps. The first step is to conduct a job analysis to determine the qualifications needed for each vacant job. The next step is to determine where and how to recruit the needed individuals. For instance, a company must decide whether to fill its vacancies externally (i.e., from the external labor market) or internally (i.e., from its own current workforce). When recruiting externally, an organization should first assess its attractiveness in the eyes of potential applicants; unattractive employers may have trouble generating a sufficiently large applicant pool. Such employers should attempt to increase the number of people who are attracted to the organization and thus interested in applying for a job there. This may be accomplished by increasing starting pay levels and/or improving benefit packages. Another option is to target certain protected groups whose members may be underemployed in the local labor market, such as older, disabled, or foreign-born individuals. Internal recruitment efforts can be improved through the use of career development programs. When designing such a program, the organization should collect work history and skill level information on each of its employees. Such information would include age, education level, training, special skills (e.g., foreign language spoken), and promotion record, and should be stored on a computer. This employee information allows the organization to identify current employees who are qualified to assume jobs with greater responsibility levels. For instance, in departments where skilled managers are in short supply, a management replacement chart can be prepared that lists present managers, proposes likely replacements, and gives an estimate of when the replacement candidate will be trained and available to fill an open position. Instead of hiring new workers to meet increasing demands, an organization may decide to improve the productivity of the existing workforce through additional training. Other options include the use of overtime, additional shifts, job reassignments, and temporary workers. Another option is to improve retention rates. When this aim is met, firms will have fewer job vacancies to fill. Retention rates can be improved at the outset of the employer/employee relationship, when applicants are first recruited. Retention rates are likely to improve when applicants are given a realistic preview of what their jobs would actually be like (warts and all), rather than an overly glowing one. Workers want to feel valued and needed by their organization. In a climate characterized by mergers, acquisitions, and layoffs, many workers feel very insecure about their jobs. Employees with such feelings often begin shopping around for other jobs. These fears can be eased by implementing HR plans for training and cross-training. Such plans allow workers to perform a variety of functions, thus ensuring that they have the necessary skills to continue making contributions to the firm. Management training also is crucial in this regard. Organizations must train managers to be good supervisors. Poor "people management" is a primary cause of voluntary turnover. Managers at all levels should know what is expected of them, in terms of managing people instead of just managing budgets. Companies also can improve retention rates by creating a work environment that encourages employees to participate actively in the company's total welfare. Workers want recognition for their contributions to organizational progress, but this recognition must be tailored to the workers' individual needs. While some workers may be motivated by monetary rewards, others seek recognition by peers and managers, feelings of accomplishment, or job satisfaction. Workers now demand more flexible schedules to best fit their lifestyles. Organizations can improve retention rates by implementing programs to accommodate these needs, such as job sharing, shortened workweeks, and telecommuting via computer and modem. Finally, companies also can improve retention rates by offering attractive benefit packages, such as generous retirement plans, stock ownership, health and dental insurance, and employee discount programs. Many firms are now offering "cafeteria plan" benefit packages, which are tailored to the specific needs of each of their employees. The opportunities to add more services are endless and continue to improve. For most companies, the hardware and software needed to run these programs are fairly standard. Hardware and software is dependent on the complexity of the HRMS package; more complex HRMS packages require more hardware (e.g., server space and speed). HRMS technology costs vary considerably, depending on the size of the company and its HR needs. Costs for deploying a comprehensive HRMS package include license fees, implementation, technology, training, and maintenance. Costs typically range from $300 to $700 per employee as an initial investment for companies with more than 1,000 employees. Smaller companies may decide it is better to rent the application than buy it. Research has found that most companies can recoup HRMS costs within three years of system launch, based on process efficiencies alone. The value of HRMS results from a reduction in HR support costs, based on efficiency improvements. "Hackett's benchmark for the average annual cost of HR services per employee is approximately $1,900, with a best practice goal of less than $1,200" (Hamerman). By eliminating paper and process inefficiencies, companies can expect additional cost reductions while improving service and becoming more efficient. There are many other benefits of HRMS. Giga Information Group believes that HR departments can reduce time spent on administrative work by 40 percent to 50 percent, resulting in either the elimination of headcount or the redeployment of effort to higher value tasks, such as decision support and employee development. Another benefit of HRMS includes allowing HR to transition from an administrative department to a strategic management department. The strategic value aspect of the HRMS investment focuses on managing human capital by supporting functions such as recruitment, performance/competency management, employee development, and employee customer service. By executing well in these areas, companies can reduce employee turnover, reduce hiring costs, and improve individual performance. ADP offers a comprehensive suite of software that can run on almost all modern operating systems. A major player in the HRMS business is PeopleSoft. Acquired by Oracle Corp. in January 2005, PeopleSoft puts it focus on one complete HRM product line. This suite not only works in the HRM arena, it also allows employers to buy modules for CRM, SCM, and many other areas. There are three versions of the company's Enterprise suite: Enterprise, EnterpriseOne, and PeopleSoft World. Plan the workforce needed to carry out an organization's business objectives, attract the right people, and provide them with the tools they need to be productive. Assess workforce skills and design learning and performance programs that develop people in alignment with their career paths and corporate objectives. Optimize a global workforce by putting the right people in the right jobs at the right time. This includes tracking the workforce and monitoring performance. Plan compensation and reward structures that align the workforce with corporate objectives. This includes linking the right employees with the right types of compensation, and rewarding them with a total package that maximizes efficiency, reduces costs, and increases overall performance. Maintain a database of employee skill sets and competencies, as well as information about outside applicants. Track approved positions and headcount by company and department. Track recruitment data, such as where a company is finding employees, how long they stay, qualifications, and recruitment costs. Simplifying the employee evaluation process through automated workflow, which automatically alerts employees and managers about scheduled performance reviews. Helping managers to understand discrepancies between employees' expected and actual performance through built-in competency gap analysis tools. Providing true exception reporting with flexible reporting tools that summarize data, embed workflow messaging, and populate spreadsheets. Flexible and affordable pricing. Pre-integrated applications optimized on an IBM iSeries means lower implementation costs and ongoing IT needs. At the same time, users get a flexible architecture that enables them to tailor menus, security, and reporting to the specific needs of their business without costly modifications. Self-service capabilities: Web browser-based access to applications enables employees, customers, and suppliers to access relevant information quickly and easily, with less training. Full, robust solution: PeopleSoft World is a comprehensive, but low-maintenance solution for small businesses. It offers the same functionality available to larger enterprises, not a stripped-down version of a larger solution. It supports multicurrency, multi-language, and multi-company requirements and provides integration with other key PeopleSoft technologies. All PeopleSoft Software is built on a Web-based platform, enabling "portal" technology. For both Enterprise and EnterpriseOne, portals are available to connect with employees over the Web. Technology continues to evolve, and HR is no exception. One of the fastest growing trends in HRMS is Web-based training/e-learning. E-learning tends to be far more affordable than classroom learning, and a higher degree of focus results in time savings. Not all e-learning is the same: some courses are self-paced with tutors available, some are instructor-led in real time, and some allow for student interaction. Another HRMS trend is the use of online surveys. This allows companies to get fast information on their employees, policies, procedures, competition, and anything else they decide to survey. This also gives employees a sense of belonging and contributing to their company. Online employee surveys usually have an 80 percent return ratio, which is much higher than paper surveys. Employees are becoming more self sufficient in the workplace because of HRMS and the growth of technology. They are able to answer questions, down-load forms, enroll in benefits, change payroll options, and complete training on their own. This saves both time and money. An employee does not have to make several phone calls in order to speak with the one person who knows the answer to their questions. Answers are readily available, usually on the company intranet. This also frees up HR to focus on more profitable activities for the company, such as recruiting and employee development. Another growing trend includes improved methods for monitoring and managing employees' use of the Internet. This helps management to improve productivity, reduce legal liabilities, and control IT costs. Companies are blocking e-mail that may be offensive in order to reduce legal liabilities. They also are blocking Web sites that are inappropriate for workplace viewing. This has improved productivity by reducing non-productive activities. HRMS providers have products for companies of all sizes. These providers profit by maximizing the services they offer. Therefore, they are going to target large companies that need more support. However, providers are still interested in small companies, and those that will need more support as they grow. As the need for corporate cost-cutting, efficiency, and productivity becomes more important, the HRMS industry is going to continue to have strong growth potential. Not only can HRMS help with employee administration from recruiting to benefits, it can save companies thousands of dollars by lowering workforce and employee turnover levels. By 2005, the corporate world had only seen the beginning potential of HRMS. Gueutal, Hal G., and Dianna L. Stone, eds. The Brave New World of eHR: Human Resources Management in the Digital Age. San Francisco: Jossey-Bass, 2005. Hamerman, Paul. "HR and Administrative B2E: Maturing and Expanding." Business.com, 2005. Available from < http://www.business.com/directory/human_resources/outsourcing/hrms_hris >. ——. "Justifying IT Investments: Human Resources Management Systems." Giga Information Group. Available from < http://www.majoraccounts.adp.com/news/art_hrms.htm >. "Human Resource Information Systems (HRIS) Outsourcing." Business.com. Available from < http://www.business.com/directory/human_resources/outsourcing/hrms_hris >. Losey, Mike, Sue Meisinger, and Dave Ulrich, eds. The Future of Human Resource Management: 64 Thought Leaders Explore the Critical HR Issues of Today and Tomorrow. New York: John Wiley & Sons, 2005. Oracle Corp. "Products and Industries." Available from < http://www.peoplesoft.com/corp/en/products >.